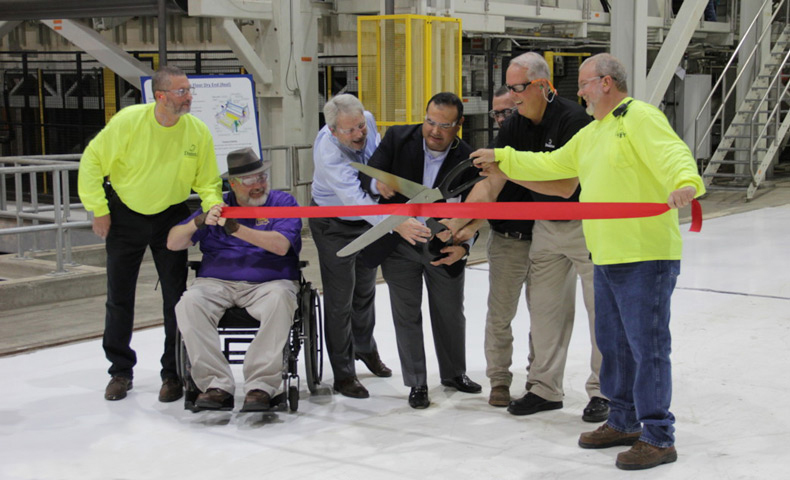 Nov. 3 marked a new day in Domtar’s history, with a ribbon-cutting ceremony at the Ashdown Mill in Ashdown, Arkansas, celebrating the startup of a newly converted fluff pulp machine. The conversion of a paper machine at the Ashdown Mill to produce Lighthouse Fluff Pulp is the largest capital project in the company’s history, making Domtar the world’s third-largest fluff pulp producer. The fluff pulp produced at the mill will be used to make baby diapers and incontinence products sold around the world. This extensive construction project began in early 2015 with the demolition of one of the mill’s paper machines. The mill then built a fluff pulp machine that could produce rolls and bales, depending on market demand. For nearly two years, hundreds of people — including local employees, contractors and employees from across Domtar — worked at the site. While the most visible work at Ashdown was the construction of the machine and its many parts, the work happening in the training area was equally important. The operating crews received two months of classroom training and were well-prepared for startup. The effort — from planning and finance to demolition and construction to engineering and operations to sales and marketing — culminated in August, when the first pulp ran on the machine. Work continues this fall on the installation of the calendar, reel and winder equipment. The first fluff pulp rolls will come off the machine in November. Ashdown Mill manager Bob Grygotis praised the team. Domtar Pulp and Paper President Mike Garcia agrees. Interested in learning more about this project? Watch this video about the mill’s fluff pulp conversion.